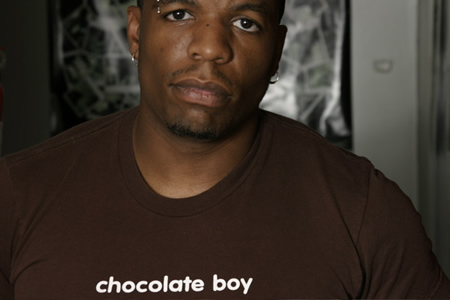 Tim’m West wears many hats, among them: poet, activist, hip hop recording artist and speaker. For the black LBGT community, he’s a much-needed visible, vocal presence. When West moved from Washington, DC to Atlanta, GA last year, many of his fans were excited about what he would bring to the "black gay mecca". One of West’s more prominent ventures is his arts event The Front Porch. Established in Washington, DC in 2004, West has gone on to host Front Porch events in Oakland, Chicago and Brooklyn. The gathering puts its official stamp on Atlanta soil during the 2008 MLK Weekend with diverse open mic and music performances by Stephen M. Lee, Ken J. Martin, Love The Poet, Phoenix and originator Tim’m T. West. I lobbed five questions at West regarding The Front Porch - Atlanta which kicks off the city’s popular weekend (second only to Labor Day as a destination for black LGBT). Who is the intended audience for The Front Porch? The Front Porch doesn’t really have a target demographic, beyond people who appreciate creative expression for all kinds of people by all kinds of people, black and non-black, gay and straight and in between, from various class and geographic experiences, coming to celebrate work that carries a great deal more integrity that what you often see in poetry SLAM settings where people are competing for prizes or fame and therefore doing whatever is needed to gain 10s (the highest rating). In short, I’d say that the people who come to the Front Porch are likely the people who’d hang out with me on my Front Porch had I a house big enough to hold everyone. The complexity of who I am as a queer black man with all sorts of creative talents invites those who see themselves as complex in various ways also, and who want to tease that out in a social and creative setting. Why did you feel compelled to start The Front Porch? The Front Porch symbolically represented this space where you could go express. And there was a rather unconditional acceptance there of your "truth". In Arkansas, where I grew up, I’m reminded of the conversations, songs, poetry shared between me and my grandmother, who was, perhaps, the first person who showed unconditional acceptance for my truth. When I went to so many Spoken Word, SLAM, or soul music settings with audiences of diverse sexual orientation, but not seeing that diversity represented on stage, I knew there was a certain hypocrisy. Why are gay folk afraid to speak the truth about their relationships, political opinions, etc… just like everyone else? You’re known as a strong, unashamed black gay man. Will performers consists solely of LGBT artists of color? This particular launch of the Front Porch in ATL consists of such artists, but this is NOT always the case. I don’t think I’ve ever done a show with no LGBT feature at all, but I generally try to provide balance. There have been some performers who do not identify and whose sexual orientation I didn’t know, because it’s not directly reflected in their work. As an event MLK weekend in Atlanta, it is important for me to make clear that this will be gay-friendly space. If there are straights who are so taken by the vibe that they want to be a part of it (which there will be) then they enter the space as features understanding that it’s a community of open people for open people. The truth is that many of my straight features and audience members have come to appreciate the Front Porch over other events they attend for that very reason. In your opinion, how is the Atlanta spoken word scene different from other cities where you’ve lived or visited? There’s an ironic silence about the overwhelming presence of LGBT people in most Spoken scenes, beyond the relative comfort that some women have integrating with the scene as OUT women who love women. There’s a lot of silence among the men. In Atlanta, I see my presence here as doing two things: being a presence in (presumed) straight settings to let people know that we are indeed in the space and won’t be heterosexualized; and creating spaces of "our own" where people can practice their art and gain the courage to integrate in the large scene with less trepidation. The silence exists in a lot of the Spoken and Soul scenes. It’s just more ironic in what is largely considered a black gay (social) mecca. Why did you choose The House of IntergiTEA as the venue for The Front Porch - Atlanta? I was told by someone that there was this space that did and open mic on Mondays that was black lesbian owned. When I first went there, I fell in love with the decor and layout of the space: art on the walls, a living room setting with tables around. It just felt like someone’s expanded living room. I believe in supporting black and gay business and helping to build communities who also invest in them. I’m pretty much a regular on the Monday nights, but I wanted to offer something a bit more formal, where I could also feature talent from out of town. The name IntegriTEA also strikes a chord with the kind of raw truthfulness expressed at other Front Porch events. So there’s integrity, there’s tea, and a place where black gay folks feel at home. To borrow a black gay colloquialism: That’s the tea, honey! There something reminiscent of Niggerati Manor in West Front Porch where black creative folk meet. Reading this, West seems to have the spirit of this former gathering of brothers and sisters within him. At lease, to me.